Makes -> Delicious & Nourishing Bowl of Soup, a complete meal. For a notorious hoarder in me who can’t stand the sight of empty shelves, it is always challenging task to empty the fridge/freezer and pantry. I kind of hate late November days when we start packing for our annual trip to India for one full month and I am not allowed to buy any fresh ingredient from mid month itself. It is very nerve-racking experience when we have to cook frozen and canned products skipping my favourite visit to weekend Farmer’s market for freshest of fresh ingredients with bright colours and packed with nutrition. This weekend I had to go through similar experience. We are leaving to India in 2 days time. Oh, I simply can’t seem to hide that stupid smile stuck on my face since past few days. I have been counting the days and then hours and now minutes. Although it’s a short trip for just 18 days, I have already planned up for each and every day of our stay. I am excited about eating all that delicious food cooked by Amma and Atte, two big functions at home, beach parties, lots of shopping, catching up with all hot gossips with cousins and friends and most importantly enjoy Indian Monsoon and Mangoes. With our trip to India and lots of other things to think of, this time it was not that difficult to deal with Spring Cleaning. With just few days left for our trip, it wasn’t surprising to see almost empty fridge staring at me. There is hardly enough vegetables to use in curries and we opted for using them in heart warming Soups, next best thing to eat and enjoy. 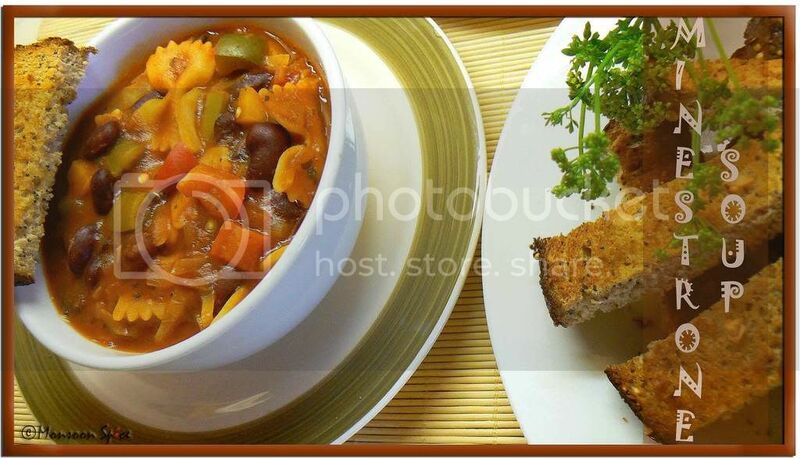 And what is better than delicious bowl of Minestrone Soup packed with flavours and nutrition. We used the ingredients based on what we had on hand rather than strictly following the recipe. We ended up with enough soup for two dinners which indeed was one complete satisfying meal. Please free to use any vegetables and beans of your choice and enjoy this bowl of goodness. Heat oil in a pan and add chopped Garlic and Onions. Saute it for 1-2 minutes on a medium flame. Now add dried Mixed Herbs or Italian Seasonings, crushed Chilli Flakes and mix well. Mix in chopped tomatoes and sauté till it becomes pulpy, approx 1-2 mins. Add vegetable stock or water, carrot, beans, red kidney beans, peppers, french beans, pasta and mix well. Cook on a medium flame till pasta is cooked well for about 5-10 minutes. Mix in Pasatta or tomato puree (if using), spinach and salt and pepper to taste. Adjust the seasoning and cook for another 2-3 minutes. You can also use other vegetables like potatoes, courgettes, green peas, corn etc of your choice. Any beans like Chickpeas, Pinto Beans etc can be used. Sprinkle the soup with Parmesan cheese if desired. Click Here for other heart warming Soups posted in Monsoon Spice. Wishing all the readers of Monsoon Spice a very Happy Vishu, Baisaki and Shubho Naboborsho. A excelent way to clean up your fridge and pantry. I too do the same hoad food things. Enjoy the trip to India. 18 days is better than none. So have fun and enjoy all the delicious food you are going to have not to mention the Mangoes. Me too have the same problem, my new posts are not appearing in TOI.. I love Minestrone Soup and this is the only Soup I relish almost every time! :) It looks absolutely lip smacking and hearty Sia. Hi hon - you won't believe it! I am cured with your Amma's recipe... I blogged about you today!!! That almost dead carrot made me laugh... enjoy India and happy Shubho Nobo Borsho to you too. Hi Sia..the pics of the minestrone soup are mindblowing..guess they tasted great..Have a nice trip..
looks delicious as usual, Sia! Nice pic too. And now you've made me crave soup tonight - *cold* outside! Where is spring??? Hey have a fun time in India! Looks like a delicious soup Sia! Have a great trip and enjoy your time with family and friends! Lucky aren't you, to be able to go home again so soon! Have fun! Hi Sups!! My wishes to you as well. Ya I noticed even my new posts are not showing up at Sailu's. Soup looks yum and oh yes visit to farmer's market on weekends is something I look forward everyweek. India trip again?????????????????????????????? Not fair!!! Just kidding dear, Have a great time and enjoy!! First of all wishing you too, a very Happy Vishu, Baisaki and Shubho Naboborsho. 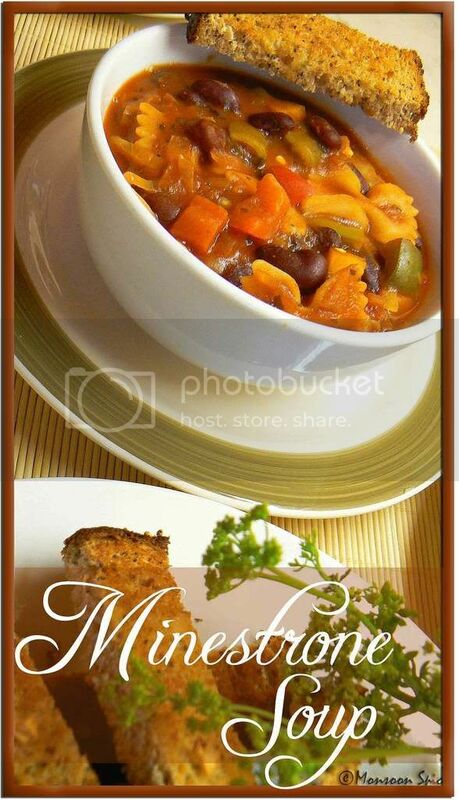 Simply loved the illustration of the minestrone soup and the details that followed. Very well done and thanks for posting it. oh, u off to india??? wow........ im so 'J' :P. u h v fun in mlore!! hw i miss the mangoes !!! :(((( btw, ur pics r mindblowing!!!!! just curious... which camera do u use?? Whenever i visit Restaurant, I order this soup, healthy & i love the most. The soup looks excellent! The pics look great. Minestrone is our fav soup at home.I've never made it from scratch as we always buy progresso brand. But now that I have the recipe, I might be making soon :o) Thanks for sharing!! another soup from sups :D.
You are correct. TOI is not popping up posts promptly :( . Love this template! Absolutely love it! Very nice recipe and picture, Sia. Hey happened to notice the new 'look' of your blog and totally love it. Hey hey you have changed your look!! This new one looks fantastic!! Lovely soup ..amazing pictures Sia!! Excellent way to help spring cleaning :). Soup and bread, what else do i need :-D. And thanks for the beautiful Kokum tambli, Sups! i am gonna' make it soon. Happy new year to you too. Have a great trip. P.S: Sorry for not having shown my pretty face recently.....been really slow on blog-hopping. feel free to pull my ears :). Best way to clean up all the leftovers in the pantry. Again to India?? I envy you. Have fun. Enjoy ur vacation. Nice look of ur site !! I was suprised to see, I thoughtt i came to a different site, but no.. its Monsoon spice :) !! Soup looks so yum !! As usuall tempting pic !! 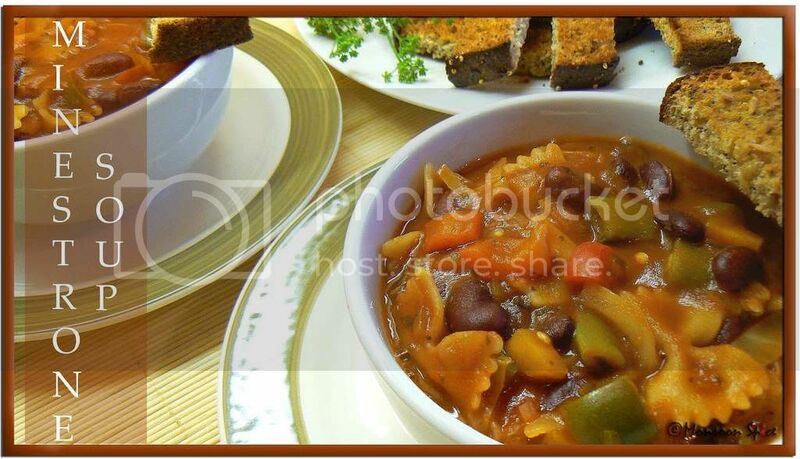 Minestrone soup is such a great way to clean the refrigerator...and its always comforting and delicious! Fab soup. I know what you mean with the TOI site. I ve had lots of troubles showing my posts as well. It is frustrating. I am hosting my new event dedicated to cooking from other blogs. I would love to have you participated as the Blog Of The Month. Lovely soup, Sia. I enjoyed your post- I too am going to India next month and although I am spending just a handful of days with family, I am so looking forward to seeing them again. Also, love the new blog header.